I don’t know whether you guys are familiar with this client but it is by far the most complete twitter client for Android. Once available on the play store, the application was then removed by request from twitter after reaching the maximum allowed authentication requests of 100 000 users, especially that the app which costed 5$ was mainly installed via blackmart and aptoide for free. That forbid users who already bought the app from the play store and those who were willing to pay for it from getting the app or any further updates it could have. However, Falcon Pro developers made the app available for free on http://getfalcon.pro/ and included a very interesting (and smart) workaround in the last update (v2.4) which allowed users to overcome the maximum allowed tokens error. Note: Users who already had an access token could easily upgrade to the latest version. 1. 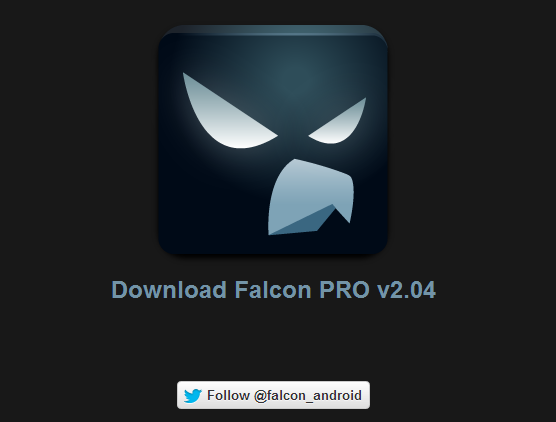 Make sure you delete any older versions of Falcon Pro if you have them and restart device. 3. Once you open the app a login screen will appear. explanation: I know this might sound crazy and it is but please carefully follow all steps. click the logo –> click all 4 corners of the screen (each corner will light up with a different color) –> turn off the orange one (click it again) –> SHAKE YOUR PHONE!! yes shake it shake it!! 6. At this point you’re in, follow ALL the instructions (Press HELP). No I mean it… PRESS THE HELP BUTTON! 7. A detailed picture guide will tell you what to do there. 8. Follow all steps and voila! Please include any questions or problems you might have in the comments. “The quantum information within the microtubules is not destroyed, it can’t be destroyed, it just distributes and dissipates to the universe at large. It’s possible that the quantum information can exist outside the body, perhaps indefinitely, as a soul,” he said. They have argued that our experience of consciousness is the result of quantum gravity effects in these microtubules, a theory which they dubbed orchestrated objective reduction (Orch-OR). Thus it is held that our souls are more than the interaction of neurons in the brain. They are in fact constructed from the very fabric of the universe – and may have existed since the beginning of time. So yes, there is a part of your consciousness that is non-material and will live on after the death of your physical body. Your Mind Can Sense The Future! An interesting new study shows that our minds can sense the future 2-10 seconds before the event takes place. This study called “Predictive Physiological Anticipation Preceding Seemingly Unpredictable Stimuli: A Meta-Analysis” shows that your mind actually has an energetic reaction to the future before it happens and before you are even aware of it. They concluded that ” the results of this meta-analysis indicate a clear effect, but we are not at all clear about what explains it”. Once again, we have mainstream scientifically stable studies that give credence to the psychic aspects of the mind and the paranormal abilities of the brain. The next time you have a thought about something before it actually occurs, that’s because your brain really is picking up on it energetically in a way we can measure. Can this be explained by the pineal gland or the consciousness field as discussed in previous posts? Is time actually non-linear?